geoDefense For Windows Phone Available Now! As a fan of Tower Defense games, I have always been trying all the variations out there in search for the best ones to play for long term basis cos many of them gets boring after a while. Tried geoDefense last year for the iPhone and I can say that it’s very addictive. Good thing is that geoDefense is now out for Windows Phone 7! The geometric vector creeps are fast and intense. With 30 different maps, each its own puzzle, you’ll have to work fast to keep up. geoDefense stands out from the rest as it uses only colourful geometric graphics on a grid line background which makes it quite futuristic looking. The variations of the towers are also very interesting; from blasters, lasers to missiles. 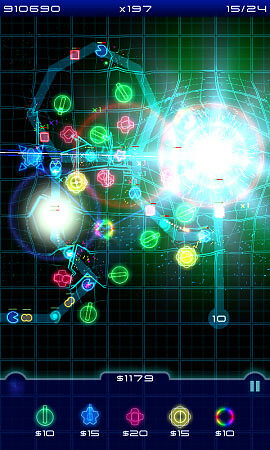 Watch their energy debris swirl through the gravity wells of your vortex towers. Don’t forget to absorb energy for AWESOMENESS! Easy Start (1 point): Beat any of the easy levels. Beat Easy (2 points): Win each of the easy levels. Easy Owned (10 points): Beat every easy level without losing a life on any.. Medium Start (5 points): Win any of the medium levels. Beat Medium (10 points): Beat 10 Medium levels. Medium Owned (30 points): Beat 10 Medium level without losing a single life!. Hard Start (7 points): Beat any hard level. Beat Hard (15 points): Beat 10 Hard levels. Hard Owned (85 points): Beat 10 Hard levels without losing a single life!. Green Machine (5 points): Upgrade a Blaster Tower to level 7. 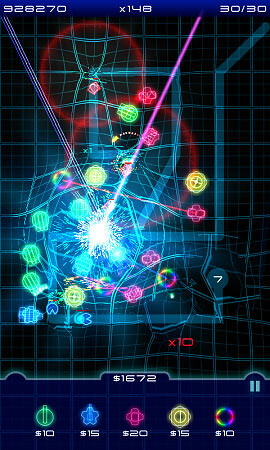 Blue Thunder (5 points): Upgrade a Laser Tower to Level 7. Red Menace (5 points): Upgrade a Missile Tower to Level 7. Shocking And Awe (5 points): Upgrade a Shock Tower to Level 7. Flux Vortex (5 points): Upgrade a Vortex Tower to Level 7. Close Call (5 points): Score a x50 Multiplier Bonus from any Creep. Turret Happy (5 points): Place one of each Turret on a level that supports all five Turrets. Find out more in the game. Check out this video below to see the game in action!